I live on a farm with 8 cows, 6 horses, 2 dogs, 1 cat, and 1 donkey. I grew up on the farm with the horses all my life so I started to ride my minature horse,Cinnamon, and then my dad rides Lance his Tennesse Walking Horse and I was horsecarzy ever since!! really cute horse pics! wish I lived on a farm. I ride at a stable, but I wish we had a farm. you're so lucky! I've tried to get my dad to buy me a horse , but he won't have it. I ride a morgan horse named lily. she is a bay, so beautiful! you are so lucky! 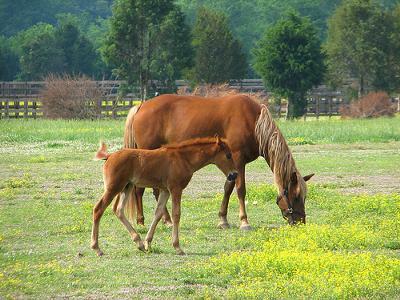 i would love to have a horse of my own, ( a tennesee walking horse)! but thanks for posting! God bless! that picure is real cute! Wow! You are so lucky to be able to live on a farm! I also Love that picture! It is too cute!